It’s not often I write about fitness, but when I come across an awesome workout program, I HAVE To share it with my fab readers! I recently got the opportunity to try out MyFitU, an- on-the-go workout app for my phone! MyFitU is a fitness program created by Daniel Meng, a very well known fitness trainer who trains a lot of huge stars in Country Music, including Kenny Chesney, Jay DeMarcus of Rascal Flats, Jake Owen and more! MyFitU was created for Daniel Meng’s celebrity clients to use while on the road touring, but is now available to everyone! What I love most about MyFitU is that it isn’t just a set of exercises to do everyday, but acts as a personal trainer, helping you keep track of your weight, goals, and even food! When you log into MyFit, it will ask you your level of experience with exercise. Then you will set a goal weight and pick rest days for your workouts. MyFitU will then set up a fitness program to meet your needs, wether you are are trying to lose weight fast, tone up, or maintain your weight! It will then set up your program with new workouts every single day! One of my favorites things about this awesome app is that it has hundreds of different exercises, so its rare you do the same exercise twice, and every day will be different! Which is exactly what your body needs, because it does remember the same workout and you won’t get the benefits you get from doing something different everyday! Once your fitness plan is set up, MyFitU will also give you an eating plan to help you reach your weight in the time frame you want, including over hundreds of healthy recipes! It will also provide you with a shopping list to make it easier to stay on track with your eating! When I logged into MyFitU for the first time, I chose advanced because I have been working out regularly for almost 10 years and I feel like I know my exercises pretty good. I also chose to maintain my weight but tone up! I loved that it only took a few minutes to get my workout set up. I then had a strength training work out on odd days and a cardio workout on even days. When I began my workout, I was thrilled to see that each exercise has an instructional video to show you how the exercise is properly done, so you don’t end up doing it wrong and end up causing damage to your ligaments! If you’re a beginner, there is a safely video also provided in this app to help you learn how to exercise properly without injuring yourself! You can also track your progress is this app, share your progress through social media, and add your favorite inspiring quotes to help keep you motivated! This is basically what each workout looks like when it pops up on your phone. You hit Play and it will show you a quick tutorial on how the workout is done. It also has written instructions for each workout, as you can see here in this picture. It will tell you how many sets and repetitions to do for each exercise as well. I also loved that it let you choose a playlist or music from your phone so you have music playing while you work out! Here are some of the strength training workouts I had in one of my sessions. Each workout is set up to last 30-40 minutes. I found that my repetitions took a bit longer so I would end up going longer or quitting a few exercises short, but I would be sure to cool down with some stretching. I really loved that each workout started with a 3-5 minute warm-up to get your muscles and body all warmed up and ready to go! I find that a lot of of workouts will save time by not adding the warm up and cool down, but both are so important to get your body up and running and the muscles stretched, so that you don’t end up doing damage to your self or pulling a muscle! MyFitU is completely affordable, and you can take it with you and do it at a gym or if you have some fitness equipment, you can do it at home! My one con about this app is that at least for the advanced level, it did have quite a few exercises one of my days, that required specialized equipment you only find at the gym, but I’ve been working out long enough I knew how to target that muscle by using my free weights or a stretch band. Also, I tend to lose count and slow down and not go as fast as If I’m watching someone do all the reps with me, so I do wish it had this feature so that you could just follow along with the person in the video through the whole workout. 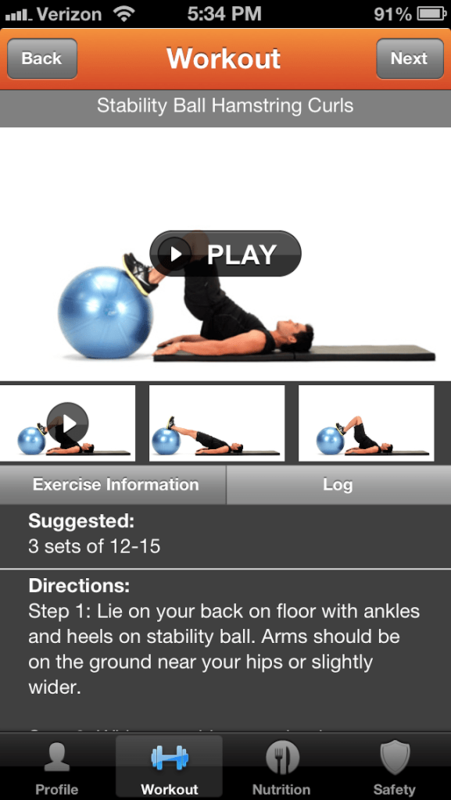 All in All, I think this is a great app and I was especially pleased with all the different exercises it provided! I think for the 2 weeks I tested it, I didn’t once do the same exercise twice! I had one day that focused on the back and It targeted every muscle back there! The next day my whole back, upper, middle, lower, and sides were super soar! I love that because it makes me feel like I really got a great workout! I found this exercise program was consistently making me soar and helping me build muscle! I loved how easy it is to use, and that I can use it anywhere on my Iphone! It is super affordable and will give you a great workout every single time you use it! If you would like to learn more about MyFitU and purchase the app from your computer or Iphone, check them out at MyFitU.com. I believe in excising in a game style! With some kind of fun equipment or by playing a fun athletic game.